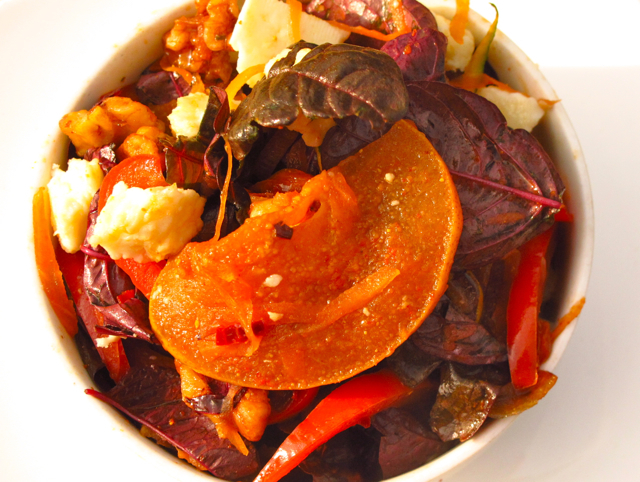 This is a warm and satisfying salad for Kapha in the Winter season. Amaranth leaves, red pepper, and pears provide a vitamin and mineral packed, anti-oxidant rich salad base. Walnuts provide omega 3 fatty acids and vitamin E as well as acts as a brain-tonic (contains lecithin which is a precursor to acetylcholine,a neurotransmitter). Walnuts also help balance Kapha (when taken in small quantities) by provoking Vata with its’ astringent property from the tannins. In addition, natural enzymes in the green papaya and heating properties of the mustard oil, red chili flakes and cayenne stimulate the digestive fire or “agni”. 5. Add all remaining ingredients to the sautéing pan with caramelized pears and mix well over low heat for 1 min. 6. Garnish with toasted walnuts and serve immediately.